I have been thinking about the belly a lot lately. Not the “shrink your waistline” belly that we hear so much about each and every New Year. No, I’ve been thinking about the inside of the belly… and its bugs. Or to be more specific – the bacteria in the gut and how important they are for proper kidney care. These bacteria are called microbiota and their collective effect and grouping within the gut is called the microbiome. Disclosure: This post is sponsored by Kibow Biotech, the producer of Renadyl, a probiotic for kidney health. As always, all opinions are my own. Want to care for your kidneys better? Take a look at your gut health. Today I want to share a basic overview of WHY the microbiome and our gut health is so important for kidney care and WHAT exactly is going on. Don’t yawn. Keep reading, because this is a big deal. The microbiome and its contribution to health is an important topic for every human, especially if you’re dealing with chronic kidney disease. There has been increased interest and research on understanding chronic kidney disease, its connection to our gut microbiota, and how it all fits into kidney care. Scientists and medical professionals are exploring the kidney-gut connection to see if there are treatment options from the microbiome-perspective to improve kidney health for those on and off of dialysis. Bugs in Your Belly: What are the Microbiota? Many of us rarely think about what is going on deep inside our gut, but it’s worth taking a look at because of the dramatic effect it has on health and disease. I’m not talking simply about digesting our food and how nutrients are important for health. I’m talking about the trillions of organisms, especially bacteria, which make their home in our gut (1). These organisms are what make-up the microbiome. There are both good and bad bacteria taking up house in our gut and impacting our health. With limited food resources available, and really nowhere to go, the bacteria are in fierce competition with each other for food and space. If the good bacteria outnumber the bad bacteria, this competition is helpful because it helps bad bacteria not “take root” in the gut when they get in. When bad bacteria outnumber good bacteria, there can be a cascade of health problems. The bad bacteria can make us sick. We all know what happens to our gut when invasive bacteria try to take up residence. One stark example we are all familiar with is food poisoning, such as from salmonella. Other bacteria can produce far more subtle, and yet more damaging, effect on our health. The good bacteria can help support our health (and that includes kidney health!). These good bacteria work so inconspicuously that we really don’t pay a lot of attention to them. We should pay attention though. At a minimum, all of us, especially if we’re concerned about kidney disease and maximizing our kidney care, need to know what we can do to nourish the good bacteria in our gut. Yes, diet is a big part of this. Before we get to diet, kidney care, and your bacteria, I want to back-up so you can really understand how the bacteria are specifically impacting kidney health. I like to compare the bacteria in our gut to people living in a house. The house is a completely different entity to the people. However, the people enormously impact the house. People fill their homes with different smells and sounds. They run water through the pipes and air through the vents. They move furniture, they paint and wallpaper, refloor, and hang things on the walls. Some people are nicer to their homes than others leading to a well-kept, well-functioning property. Others are more destructive or just plain lazy which leads to a deteriorating space. Either way, people are essential to a home as a house with NO people can lead to stagnant pipes and ultimately decay. While simplistic, this is similar to the relationship of us and our microbiota. The bacteria are the “people” and we are the “house.” Our gut bacteria are constantly contributing to the upkeep or the deterioration of our body through their life cycles. The microbiota in our gut has many functions. They of course, are important for digesting our food. That’s obvious and most of us are aware of that role. Beyond digestion, scientists are finding more and more functions of this bacteria. Everything from “talking” or signaling to our cells to how they help maintain the integrity of our gut lining. Scientists are seeing and exploring important connections between our microbiome and almost every system and organ in our body, kidneys included (2, 3). As I said, there are lots of functions of the friendly and not-so-friendly bacteria in our gut. One piece scientists are especially interested in are the byproducts our bacteria produce as they metabolize the food we send their way. These byproducts impact inflammation in our bodies by crossing the gut barrier to impact our organs like our kidneys. Some of the byproducts are kidney friendly, others are definitely not kidney friendly. Either way, knowing about them is an important piece of the kidney care picture. Several years back, the term “kidney-gut axis” was published to describe the relationship between our gut microbiome and kidney function. An “axis” always means a two-way, cyclic relationship. For example, I give you a dollar, this makes you feel happy so you give me a hug, which makes me want to give you another dollar, and then you give me another hug, etc… This isn’t a perfect example, because of course this means eventually I am broke, while you are super happy, but it illustrates what an axial relationship is. The kidney-gut axis theory suggests that a decline in kidney function impacts the gut which then impacts kidney function, and on and on (4, 9). This relationship is multifactorial beyond just the microbiome. However the most important piece in this relationship is the microbiome. There are several factors at play with regard to the microbiome, kidney disease, and good kidney care. Research shows that in the gut of people with kidney disease, more bad bacteria are flourishing over good bacteria, some of this because of uremic toxins. If you’ve had kidney disease for any length of time you’ll have heard the word “uremia” tossed around. Urea is an amino acid. Kidneys usually get rid of an excess of urea through urine. (Yep the word “urine” is derived from “urea.”). High levels of urea in the blood are toxic and are removed through dialysis if the kidneys aren’t working. But, our microbiome plays a role in urea metabolism too! With regard to the gut, scientists are seeing that uremia of kidney disease is impacting both the composition AND the metabolism of the gut microbiota (6-9). In other words, the uremia of kidney disease is impacting both how many and what type of bacteria are in our gut and also the byproducts that they give off. Yep, that’s right, with kidney disease, uremic toxins floating around in your gut may be creating havoc with your friendly bacteria and creating an opportunity for bad bacteria to flourish. Some of these good bacteria help “eat” uremic toxins. Some of the bad bacteria produce uremic toxins. Obviously for optimal kidney care you’d want more of those good bacteria eating uremic toxins, but that isn’t what is happening. With increased production of uremic toxins and decreased elimination of uremic toxins from the microbiota, a cycle of microbiome composition leading to damage in your gut ensues. It is a vicious cycle which ultimately contributes to an increase in inflammation and a decline in kidney function (4, 5). I love this graphic (shared with permission of Dr. Qui) of the kidney-gut axis showing the interaction and vicious cycle of kidneys and gut (11). What makes the bad guys bad? Let’s get down into some dirty details here. The bacteria in your gut must eat to live, just like all living organisms. This is good for us humans because we need something to eat the undigested food that makes it past our small intestine into the large intestine. Eating our undigested food is the life and mission of our gut bacteria. They are serious about fermenting food. When the bacteria “eat” they basically are fermenting our food and release byproducts. Byproducts of the microbiota are something like bacterial “poop.” Not quite, but close enough for our purposes. Some of these byproducts are very good and help our body. Some byproducts of the microbiota are not so good as we discussed previously. A healthy human system would generally excrete these byproducts through a variety of pathways, one being the kidneys. If your kidneys aren’t healthy, well, you can see where there is a problem. An increase in byproducts, such as uremic toxins, from an imbalance in the gut is causing damage and with kidney disease there is a decreased ability to excrete them, which then leads to more kidney damage. Because you care about your kidney health, I want you to get know a couple uremic toxins: p-cresyl sulfate and indoxyl sulfate. Don’t be scared by their names. They are important! Protein is one of the things that the bacteria ferment. Protein is already a big buzzword when it comes to nutrition and kidney care, but here is what is especially interesting about protein and our bacteria. By the time protein reaches our large intestine it is already broken apart into little pieces called amino acids. Think of it like if your sibling smashing your elaborate Lego creation. The Lego creation is the food, and each individual Lego is what is called an amino acid. When tyrosine, one of the little building blocks/amino acids of protein, is fermented it forms something called p-cresol. Likewise, another amino acid called tryptophan ferments into something called indole. P-cresyl sulfate and indoxyl sulfate are itty bitty bacterial byproducts, often called metabolites. They are uremic toxins. These particles are normally cleared by the kidneys. While small, they can do some ugly work in your body as they are quite toxic. P-cresyl sulfate and indoxyl sulfate been linked with insulin resistance and impairment of the renin-angiotensin-aldosterone system (think blood pressure and fluid balance) (6, 7). There are some links between their impact on healthy blood vessels, which are important for keeping your kidneys oxygenated and working at optimal levels (4-7). Other uremic toxin metabolites exist (many unknown) involved but I don’t want to overburden this post with each and every one. You can see on the graphic above NH3, NH4+, thios and amines are mentioned. Remember, bacteria in the gut can get rid of uremic toxins because some bacteria “eat” the uremic toxins for food. So, again, with kidney disease, the double-whammy is that there are bacteria producing uremic toxins AND a diminished ability to get rid of uremic toxins (both because of decreased kidney function and bacterial imbalance/dysbiosis). All of this leads to a disruption in a healthy balance of bacteria which then leads to an unhealthy gut, inflammation, and progressionof kidney disease. Not good for kidney care. Some studies (currently only in rats) are showing that correcting gut dysbiosis can correct kidney function (10). I am not suggesting that if your gut is in perfect order you won’t have kidney disease or that correcting gut dybiosis can cure kidney disease. That is overly simplistic for the many elements involved with any chronic disease. I am suggesting that if correcting gut dysbiosis in rats with kidney disease is “curing” their kidney disease, then this suggests we need to take a close look at gut health and its importance to support optimal kidney care. Let’s get back to our house and the people inside. If your house is full of very sloppy people, the house will quickly get run down. If you add even one very neat person into the mix, the house starts becoming more clean and well-kept. So you add two neat people, with one being a handyman, and now the upkeep is better and better. Likewise, if you can tip the bacterial balance in your gut in favor of beneficial bacteria, those that can breakdown uremic toxins and those that won’t be producing uremic toxins, then potentially you are able to support kidney health and decrease rate of kidney decline. This is a big win for optimal kidney care. PLUS if you support the gut so that fermenting proteins are moving at a normal rate through the gut, and not sitting in a sluggish bowel fermenting into uremic toxins, then you begin to create an environment more conducive to kidney health. This is exactly what the studies and products surrounding prebiotic and probiotic therapy for chronic kidney disease are aiming to do (8, 11). As disclosed previously, this post is sponsored by Kibow Biotech. My opinions are my own. However I was really excited to write this post because they produce a probiotic I use consistently with all my clients. And, the importance of gut health for kidney care is not talked about enough. So far, I have not seen any free class about kidney health, or any kidney center discuss the importance of gut health in management of kidney disease. So consider yourself enlightened and make sure that gut health is part of your kidney care. Kibow Biotech is currently the only prebiotic/probiotic company I know of that is kidney-focused both in their research and their prebiotic and probiotic products. Their probiotic, Renadyl, is made of bacterial strains that specifically help remove some of those uremic toxins I talked about previously. When you think of “breaking the cycle” talked about above, you can see how useful this is. Kibow Fortis is their prebiotic to help feed good bacteria. You can read more about their products here. Gut health is yet another BIG reason (as if we need another one) that what you eat makes a HUGE difference in the progression of kidney disease. If you can support a healthy gut, you can better support kidney health. Here are 5 practical steps to start helping your gut help you. First, get some prebiotics in your diet. Prebiotics are the food of the microbiota. You can get this in the form of food, like fresh fruits, vegetables, and whole grains. In general, a diet that is full of more fresh foods and more fiber is going to give you the best results. I have a whole post coming up on the kidney diet, gut, and kidney disease, so I won’t belabor the point here. You can also use a product like Kibow Fortis. Two, get a good quality probiotic on board. Not all probiotics are created equal. There are definite benefits to different kinds. I’ll be writing more about this in an upcoming post. I like Renadyl for my clients and recommend a minimum of 90 days on this therapy. I often will add additional probiotic, but I like to keep the Renadyl on board because of how it targets uremic toxins. Third, cut back the salt in your diet from processed foods and eating out. Too much salt impacts not only your blood pressure but also the microbes in your gut. Fourth, start removing processed food and preservatives from your diet. Preservatives are not kind to your gut or your kidneys. The optimal diet for kidney care is very personalized, but pretty much across the board, it is best to limit preservatives for optimal kidney care. Fifth, if you need to take an antibiotic, make sure that you ALWAYS take a probiotic as well. Antibiotics are used frequently in medicine today and often for many conditions. However, they kill both bacteria and good bacteria. More information on antibiotic and probiotic therapy from one my colleagues here. Your gut microbiome is very powerful when it comes to health and disease. Whether dealing with any stage of chronic kidney disease or any other health condition, the gut is of paramount importance. The compounding research shows uremic toxins impacting the gut and kidney disease. This is not a lost battle. You can take steps to start modulating this cycle in your kidney care plan. Decreasing uremic toxins through increased fruit and vegetable intake, decreased protein intake, and use of probiotics such as Renadyl can be helpful. Information in this post should not replace a discussion with your doctor and care team. Before starting any new supplement and to discuss further treatment information for gut health, please contact your doctor. Has your doctor talked with you about how your gut health impacts your kidney health? Comment below to let us know what you have learned that has helped you! Bull, Matthew J, and Nigel T Plummer. 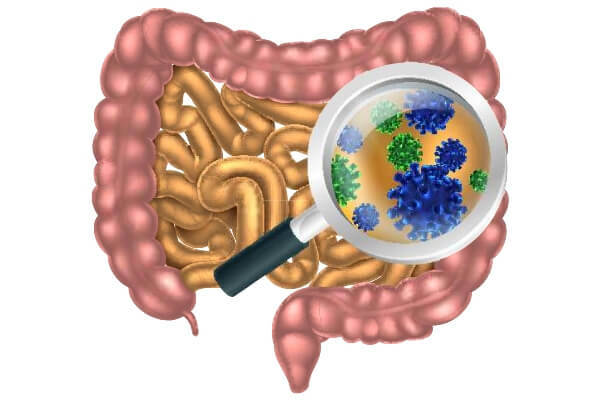 “Part 1: The Human Gut Microbiome in Health and Disease” Integrative medicine (Encinitas, Calif.) vol. 13,6 (2014): 17-22. Thaiss, C. A., et al. (2016). “The microbiome and innate immunity.” Nature 535: 65. Rossi, Megan, David W. Johnson, and Katrina L. Campbell. “The kidney–gut axis: implications for nutrition care.” Journal of Renal Nutrition 25.5 (2015): 399-403. Fernandez-Prado, R.; Esteras, R.; Perez-Gomez, M.V. ; Gracia-Iguacel, C.; Gonzalez-Parra, E.; Sanz, A.B. ; Ortiz, A.; Sanchez-Niño, M.D. Nutrients Turned into Toxins: Microbiota Modulation of Nutrient Properties in Chronic Kidney Disease. Nutrients 2017, 9, 489.Gryp, T, et al. “p-Cresyl Sulfate.” Current Neurology and Neuroscience Reports., U.S. National Library of Medicine, 29 Jan. 2017, www.ncbi.nlm.nih.gov/pubmed/28146081. Nallu, A, et al. “Gut Microbiome in CKD: Challenges and Opportunities.” Transl Res., vol. 179, Jan. 2017, pp. 24–37., doi:doi:10.1016/j.trsl.2016.04.007. Vanholder R, Scherpers E, Pletinkc A, et al. The uremic Toxicity of Indoxyl sulfate and p-cresyl sulfate: a systematic review. J Am Soc Nephrol 2017: 25: 1897-1907. Ramezani, Ali and Dominic S Raj. “The gut microbiome, kidney disease, and targeted interventions” Journal of the American Society of Nephrology : JASNvol. 25,4 (2013): 657-70. Hu, Jingjuan, et al. “Enteric Dysbiosis-Linked Gut Barrier Disruption Triggers Early Renal Injury Induced by Chronic High Salt Feeding in Mice.” Nature News, Nature Publishing Group, 25 Aug. 2017, www.nature.com/articles/emm2017122. What is the cost of a months supply of Renadyl? What drug stores carry this in the Kankakee, IL 60901 area.